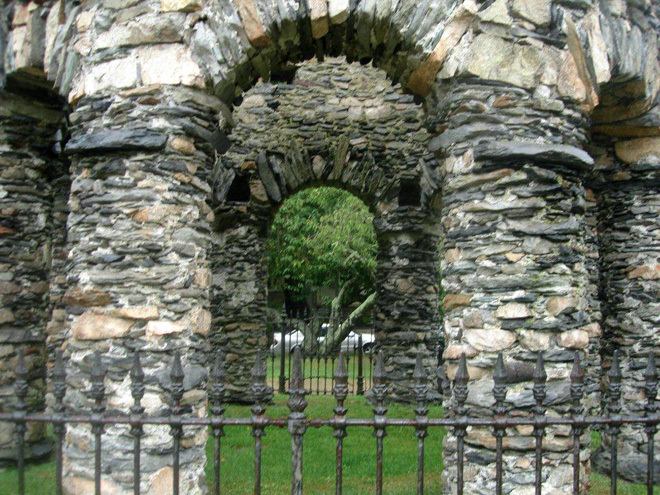 Nick Kondon investigates the mystery of who built the Newport Tower in Newport, Rhode Island and why. It annoys me that no one can tell us with convincing authority who built the Newport Tower. You knew there was an enigmatic tower in Newport, Rhode Island, didn’t you? The Tower stands 28 feet tall. Everyone agrees on that, and there, any and all agreement ends. For example, the Tower’s diameter when measured SE to NW is 22 feet 2 inches. But, measured E to W it’s 18’4”. So, it’s not only old matrons that are eccentric in Newport. The Tower is a circle, or at least it should be. How hard is it to describe a circle? Put a stake in the ground, walk around it with a rope of fixed length, drawing a circle on the ground as to you walk and, Pythagoras!, a perfect circle. Not in Newport. The Tower proper is elevated on eight legs of decidedly elephantine design – fat, and robust, with wide feet shaped like the old umbrella stands the Queen’s bureaucrats brought back from In-jah. It has several windows, openings really, but they are not at the same height, or of the same size, nor symmetrical one to the other. And, it has two fireplaces, dangerously built on wooden floors. Stranger still, one chimney-less fireplace was constructed on the second floor! Not a good way to insure longevity, but there it is – up a flight, on oak planks. I think that rules out some of the claims that have been made regarding the Tower’s use. For example, the first Benedict Arnold, some say, built it as a mill around 1650. Not likely. Mills, in their operation, produce a fine dust. So, fine that it is not only flammable, but under some conditions, explosive. 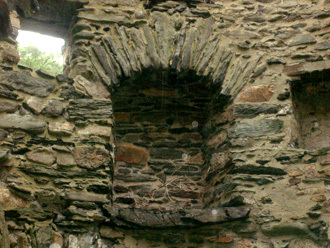 If I owned a mill, it would not have a fireplace on the second floor. At least, not for long. The first written acknowledgment of the Tower was around 1700. But, carbon dating indicates the Tower stood for scores of decades, maybe as long as three centuries, before it was described on paper. The list of suspects, before and beyond Benedict Arnold, exceeds the number in a Clue game, The Tower could have been built, say the “experts”, by Celtic monks between the 6th and 11th century or, by Irish monks during dates not stated. Some posit Pagan Vikings around 1100 or, the Templars in the 12th century. Maybe shipwrecked Portuguese built it around 1500. Of recent date, 15th Century Chinese have been given credit for its construction. That’s a little less than half the list, but the balance is too unlikely to consider. Let me dispense with some of the would-be progenitors with the same helium-weight evidence that put them on the paternal list to begin with. I say the Vikings didn’t build the Tower. I’m not an expert on the Vikings, but I know they never built a structure like this anywhere else. 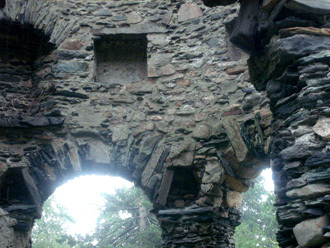 Yes, they used stone, but they liked to live half underground, in longhouses. Did redheads with shallow keels row south from Newfoundland, skidding sideways to the waves and winds until trapped inside the forearm and elbow of Cape Cod, and then row out again to sea, south to Rhode Island Sound, and finally, north to Newport? No. The Vikings do not have the DNA we’re looking for. 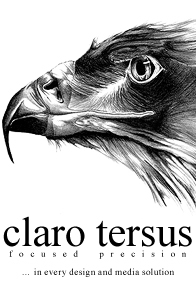 Next case. The Scottish Templars, too, are credited with Tower paterfamilias, the evidence being that there are similarly shaped towers in Scotland. Similarly shaped? That’s compelling. Simply put, the narrative for knights is: they came, built a tower with no determined utility, and left, not to return for centuries. No other traces of these intrepids are to be found. A stronger case is, “The butler did it.” The Knights were natty dressers, but not rock stackers. Scottish or Irish Monks? No, and no. These two suspects just underscore the dart-throwing authorship of this whodunit. Here are a few unanswered questions about monks: How did they get here? Why did they come? What did they leave behind? Not a word in Celtic literature or lore telling about them sailing beyond where every navigator of the time knew that folks fell off the Earth. Two storytelling cultures, but no story. Monks were Godly men, no doubt, but monks hung bells in towers after someone else built them. This leaves us with pair of Portuguese siblings, and a Chinese admiral. In Part Two we’ll put them in a line up and see if we can come any closer to making an arrest. 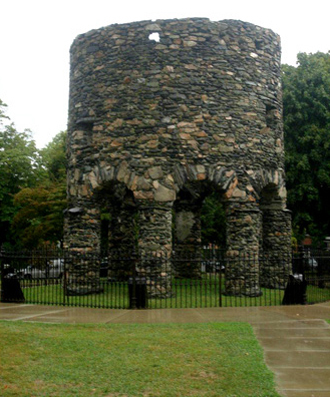 In the meantime, the Newport Tower is located at the top of Mill Street in Touro Park. If you visit, and find clues, call our Tip Line.